The end of the arc is here and as per usual for the cast of The Wicked + The Divine, nothing we’ve predicted thus far will happen the way we think and an entirely new can of worms will be opened as we enter the final arc. Continuing forward with the Pantheon and all of the terrible decisions they make along the way, this issue stays with the ongoing plots concerning the group of God’s that are being played by Minerva, the young Goddess who has a lot more going on than she appears to let on. There are a lot of character groups that relate to different parts of the plot as the arc continues on. With Minerva, Woden, and Cassandra the plot focuses on the problems concerning Persephone’s status and the work to get her back where they need her. Minerva works her web and the boundaries of the character have evolved into a sneaky villain that maneuvers every God in her path directly where she needs them to be. Gillen setting the two technically big bad’s of the book up as partners but with their own motives and one character completely unaware that they’re being played is funny for the reader as the dialogue from Minera and Woden dances around what’s really going on and leans more on Woden being in control. McKelvie has always been one for character-focused work in his pencils and it remains consistent here with Minerva and Woden having a conversation about the use of powers and working to reach Persephone. Wilson’s colors are perfectly balanced between the techno hues of Woden and his makeshift lab with everything from the angles, panel to panel, taken into account for the lighting of Minerva. Cowles lettering for the God’s is stylized to represent the more diverse set of characters and pages dedicated to specific characters like Laura later on. “Mothering Invention” has been about the initial occurrence of Anake, Minerva, and how The Destroyer can bring about ruin over it all. Going back to a flashback moment we saw earlier in the arc, some rules concerning the Sister Gods are revealed that throws everything into concern about the now-present for the title and it makes the endgame of Wicked and Divine a personal matter that’s been going on for centuries. Gillen rewrites the rules of what we’ve come to know for the title in a way that brings it all together and doesn’t exactly change the entire scope of the series but definitely zeroes in on the overreaching plot that we’ve come to know and uses the past to nearly getting us full circle. What follows is a much-needed catch up with Laura and her inner narration that keeps us abreast of her feelings and thoughts as more events, concerning her, spiral out of control. McKelvie and Wilson are a well-known match when it comes to art and characters that dazzle the page and bring life to them given the emotional range he renders and Laura’s run-in with a few “fans” proves no different. McKelvie panel by panel keeps up with Gillen’s narration of Laura and her journey with every panel giving us action or the slightest change in her face that mirrors what she’s thinking in her head. Things get tense in a standoff that brings up some very human material that has all of the emotion with only a few words spoken about it. It’s a sequence that means a lot of different things for the cast of characters and we see every God that matters for the conversation take on what Laura has said. Minerva has the best part with the newfound revelation as if she’s giving herself the final pep talk to confirm her plans to win this game once more. As a finale goes, this particular arc’s a tough one as it truly does feel like everything is coming to an end with the pieces being lined up in this game or so some think. Gillen ends “Mothering Invention” with Laura and it’s a well-needed reprieve of sorts from the bombardment of shocks that this arc has put us through. Wilson bathes The Underground and her “home away from home” in darker colors almost breaking up Laura’s final speech into three different acts based around three colors. The character of Laura Wilson started us out on this journey and her character arc here is another big jump with both a human and God-like issues plaguing her. The writing and handling of her across almost forty issues have been a true rollercoaster and Gillen packs a lot of vigor into the young woman as she comes to term with what her life is like and ponders the bigger questions that leads to one of the biggest last ending pages of the series to date. 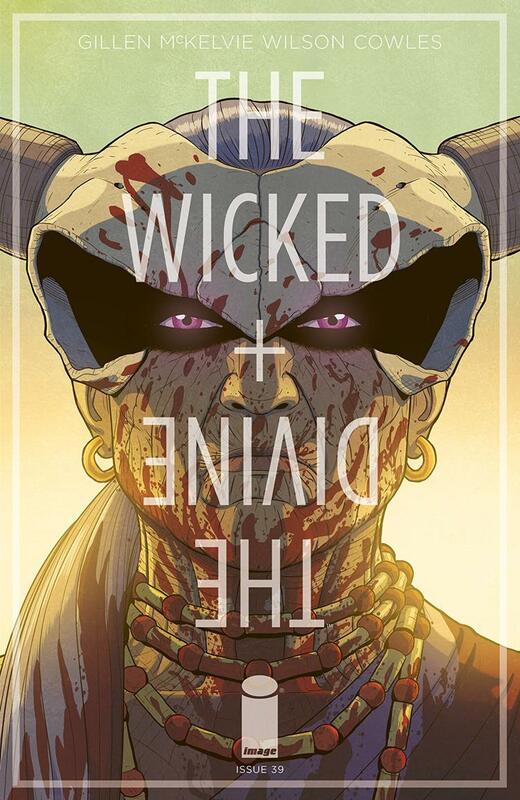 The Wicked + The Divine ends another arc as it sets up for its final outing and even when it prepares to answer the questions that have constantly been spread out across the series, we still get new surprises along the way that should be a treat for longtime fans of the series with the nature and rhythmic nature of the series. What’s to be said about a series with one of the most consistent art teams out that hasn’t been said? McKelvie, Wilson, and Cowles are a force to be reckoned with and whether it’s just characters talking or traversing the landscape…the team has injected everything into this title that has made it an enjoyable read since the start. “Mothering Invention” ends on a high note with a cliffhanger ending that sets up another ride with the Pantheon, a few more questions, a lot of witty dialogue, and those have been the hooks since the start.